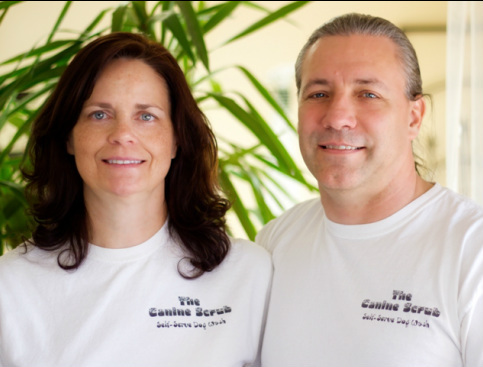 Hi, we are Lezlie Ferguson and Mike Wensel, co-owners and operators of The Canine Scrub. We've been large-breed dog owners and all-size dog lovers for all our lives. We know many of you have this in common with us and we know how important it can be to have your canine companions with you at every opportunity. You probably know that keeping your dog's coat clean is not only healthy for them, it's healthy for you and those who visit you. We're here to help you with that, all year round. Come try us out and see if you don't find yourself hugging your clean, healthy dog more often—and feeling better yourself. I'm Mike Wensel and I love being back in Nebraska after spending more than 30 years away. During that time, I lived in Paso Robles and Sacramento, California; Aurora, Colorado; and Eugene and Junction City, Oregon. But I pretty much grew up here, so this is really home for me and it's always good to be home. I started researching this business several years ago while studying Business Management at the University of Phoenix. That's right, I'm a Phoenix, but always a Husker first. Go Big Red! On the west coast, I frequented the local scrubs there with my dogs and saw how busy they were all the time. I saw how practical and fun the self-serve dog wash business was, and thought to myself, this is really cool—I love being around other people and their dogs. There is something about people when they are with their dogs; they seem more real and friendlier. I noticed that the raised tubs and friendly atmosphere made washing our dogs easier and less stressful on all of us. I dreaded giving our two dogs a bath at home. Bathing them in our bathtub was ridiculously difficult, stressful, and messy. It was just so much easier to take them to the local dog wash, pay a few bucks on a bath and some quality shampoo, and be on our way with two very happy dogs. We left all of the mess at the store for them to deal with, and had a great time in the process. So, after moving back to Lincoln and completing my college studies, Lezlie and I decided we needed to do something smart, and began our path down business ownership. With a lot of help from some of the best friends and relatives a guy and gal could ever have, we designed and built three custom tubs and put them into a location that we felt was about as central Lincoln as we could get. Lezlie is not only a wise business partner and wonderful mother and grandmother, she is also a skilled, multifaceted artist and craftswoman. She does the most amazing things with all kinds of materials and has created and incorporated a line of dog related artwork and craft-wares into our store. Many of the items she has created are for sale at The Scrub where you'll find them displayed throughout the facility. She also maintains a Facebook page where you can see tons of her work. Check it out here - Doors, Windows, Walls and More. So, come on down and check out The Canine Scrub! Your dog is going to love you for it, and you'll have one less reason to visit your chiropractor.